I’m such a hoarder, I find it really hard to throw things away. As well as those ‘just in case’ things, I also have loads of ‘I just don’t know what to do with’ things. I’ll keep things because I can’t bear the thought of them landing up in landfill, even broken things or old plastic packaging. But then the problem is it starts to build up in our home and starts creating negative energy; for sure a cluttered home can mess with your head space. Obviously not buying stuff can help but a lot of ‘stuff’ just still appears. I’m really trying to clear things away – albeit slowly. I thought I knew a bit about recycling but actually this clearing out is becoming an education – I’m sending a lot of emails to ask about how I can dispose of things and I’m learning a lot. Being a make-up artist means lots of little pots, cases, tubes and such like. The brands that I choose to use are doing some amazing things with packaging; recycled materials, refills and compostable bags for example. These definitely make life easier. However there are still bits that can’t be recycled and also just because something theoretically can be recycled, it doesn’t mean that the possibility is there with what your local council does for example. Apparently 80% of UK landfill waste can be recycled, but it can be tricky as to actually how to do it. Step in TerraCycle! I’ve recently found this company and what they are doing is fantastic. They have many different programmes recycling a whole host of household and office waste – many of them are free to use. There are a couple of beauty ones that I really wanted to share with you. The first is with L’Occitane and involves simply dropping off your empties at participating stores. The program was developed primarily to find a solution to some of the components in L’Occitane’s own ranges that were not readily recyclable in some boroughs and counties throughout the UK and Ireland. Originally the scheme was designed to accept only full sized plastic containers from both L’Occitane and other beauty companies, but it is growing. Accepted waste now includes, aluminum packaging, metal case caps and closures, refill pouches, flexible plastic tubes and rigid plastics. I delved a little deeper and asked L’Occitane what else from my make-up kit could be recycled.. I am so pleased that they confirmed lipstick cases could be – these have always been a bit tricky if made with mixed materials. They can also accept mascara tubes, but not the brush, so I’m assuming this is the case for things like lip glosses too. Eyeshadow cases and pans can also be recycled as long as they’re emptied out of any remaining product. All wonderful and very welcome news. The other programme is by Garnier and includes packaging for wipes which is another very welcome piece of news (remember a lot of wipes actually contain plastic so choose wisely if using them :)). 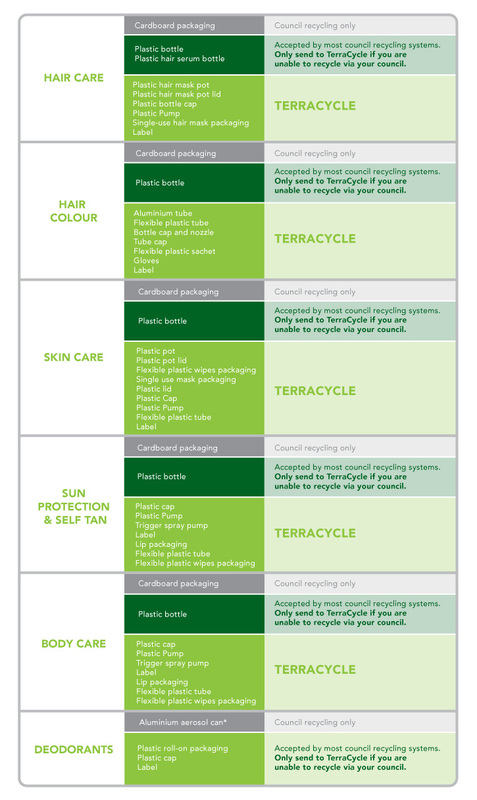 A full list of what can be recycled is available on the website. To use this programme you can either find a local drop off or you can sign up and send your waste for free. When recycling your waste, you can also collect TerraCycle points for your chosen charity or school. I’m currently trying to get my daughter’s school to sign up as a drop off point as there are so many programmes available all giving the chance of earning points. I’ve got a few questions that I asked TerraCycle and am awaiting answers so will update as soon as I hear..
Are you an avid recycler? Any top tips?! Previous Post Hiro Cosmetics Liquid Lip Paint..
Next Post New Lavera Foundations..